The Movie Comic Media (MCM) Expo Group organises the London, Birmingham, the Midlands, Ireland, Northern Ireland, Belfast, Manchester, Scotland, Liverpool, Stockholm, Malmö, Copenhagen, Belgium and Hannover MCM Comic Cons. It was founded in early 2001 by Paul Miley (ScifiShows) and Bryan Cooney (Wolf Events), both well known organisers within the fan convention entertainment industry. The convention is held twice each year, usually on the last full weekend of May and October. There have occasionally been exceptions to this such as May 2009. The event started as a single day and has now expanded to run across three days attracting attendance and involvement from industry luminaries such as Universal Studios, Twentieth Century Fox, Manga Entertainment UK, All the Anime, NEO magazine and Marvel Comics. On 23 October 2017, ReedPOP acquired MCM and all of its events throughout the UK. The MCM London Comic Con has a large floor-space for dealer stands and exhibitors which include media companies such as film studios and TV stations. There is also a theatre space that includes a large stage with projection monitors on either side and seating for approximately 1,000. Guests from popular media are commonly invited to the show. They take part for a variety of reasons. Often, this is to promote their latest product or production whether it be movie, TV or print. Sometimes it can be to raise awareness and funds for a charity or cause important to them. It is common to see television and film personalities selling autographs and interacting with their fans both in person and on stage during question and answer sessions. Along with panels, seminars and workshops with comic book professionals, there are previews of upcoming television and feature films, and portfolio review sessions with video game companies. The event also includes an autograph area where big names in movies and TV sign items for the public. Ticket holders are allowed, and in many cases encouraged, to take part in cosplay. Cosplaying has become one of the most popular parts of the show. This can be to show off the costumer's latest work, to show devotion to their favourite characters or engage in role-play with other cosplayers in the same series, as well as to meet new people with mutual interests. The show also hosts the EuroCosplay championships which take place every October with one of the UK qualifying entries being decided at the May event. Comic Village is an area of the show that is co-ordinated by Gary "Wheels" Howe, a member of the MCM Expo Group. This area has approximately 200 tables, where amateur as well as professional artists, writers and publishers sell their comics as well as prints. It also has a signing area where big names in the comic industry come and sign for members of the public. Previous guests include Gail Simone, Kevin Eastman, Frazer Irving and Antony Johnston. In 2010, MCM Fringe Festival was re-vamped and given a new logo. The main purpose of Fringe is to allow cosplayers to organise photoshoots, meet-ups, picnics and get-togethers. Organisers are more easily able to create their own event within the Expo and broadcast it. At the same time, the rest of the Expo attenders can search the website and decide to go to it. Photoshoots will be more successful and likely to attract more people from the same anime or game to take part. Previous events have included picnics, dances and video gaming tournaments. VidfestUK is an area of the expo dedicated to online visual media, such as animations, vlogs and various web series. Notable guests include YouTube partners such as TomSka and MrWeebl. MyM's stand hosts celebrity signings, which are available to anyone who purchases a copy of the magazine at the event. Past signings include the voice actors Mark Meer (Mass Effect’s Commander Shepard), Courtenay Taylor (Resident Evil: Damnation, Star Wars: Knights of the Old Republic), D. C. Douglas (Resident Evil: Revelations 2, Transformers: Rescue Bots) and Adam Howden (Anders in Dragon Age II, Shulk in Xenoblade Chronicles and Pipin in Final Fantasy XIV). MCM BUZZ is a website in association with MCM, bringing all the latest media-related news from movies, comics, interviews with celebrities and a live podcast. ^ a b McIntyre, Alex (May 31, 2016). "MCM London Comic Con celebrates record-breaking weekend". Wharf.co.uk. Retrieved May 31, 2016. ^ a b "ReedPOP Acquires UK's Largest Pop Culture Conventions". Forbes. Retrieved 16 July 2018. ^ a b "Record crowds join the stars at MCM London Comic Con!". Retrieved 12 November 2015. ^ Morris, Steve (25 May 2012). "The Final Eagle Awards have Landed". Comics Beat. Archived from the original on 6 June 2012. Retrieved 25 May 2012. - Spurgeon, Tom (25 May 2012). "Your 2012 Eagle Awards Winners". The Comics Reporter. Retrieved 25 May 2012. ^ "London Movie Comic & Media Expo 2005 Information". Fancons. Retrieved 16 July 2018. ^ "London Movie Comic & Media Expo 2006 Information". Fancons. Retrieved 16 July 2018. ^ "London Movie Comic & Media Expo 2007 Information". Fancons. Retrieved 16 July 2018. ^ "London Movie Comic & Media Expo 2008 Information". Fancons. Retrieved 16 July 2018. ^ "London Movie Comic & Media Expo 2009 Information". Fancons. Retrieved 16 July 2018. ^ "London Movie Comic & Media Expo 2010 Information". Fancons. Retrieved 16 July 2018. 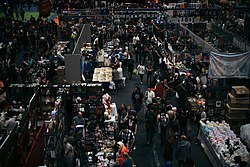 ^ "London Movie Comic & Media Expo 2011 Information". Fancons. Retrieved 16 July 2018. ^ "London MCM Expo 2011 Information". Fancons. Retrieved 16 July 2018. ^ "London MCM Expo 2012 Information". Fancons. Retrieved 16 July 2018. ^ "London MCM Expo 2013 Information". Fancons. Retrieved 16 July 2018. ^ "MCM London Comic Con 2014 Information". Fancons. Retrieved 16 July 2018. ^ "MCM London Comic Con 2015 Information". Fancons. Retrieved 16 July 2018. ^ "MCM London Comic Con 2016 Information". Fancons. Retrieved 16 July 2018. ^ "MCM London Comic Con 2017 Information". Fancons. Retrieved 16 July 2018. ^ "MCM London Comic Con 2018 Information". Fancons. Retrieved 16 July 2018. Wikimedia Commons has media related to MCM London Comic Con. This page was last edited on 26 March 2019, at 14:18 (UTC).